LOUISVILLE, Ky. (AP) — Asia Durr has always been known as a scorer. Now, Louisville’s top player is finding other ways to beat opponents. Louisville finally broke away with a 10-2 run than spanned the final minute of the third quarter and the first 1:38 of the fourth that. Bionca Dunham’s inside jumper made it 68-52 with 8:22 left in the game. Durr, a senior guard and national player of the year candidate, didn’t just provide a scoring punch. She added a career-high eight assists before leaving the game with 3:21 left. Five of those came in the final quarter. “She’s really starting to see the floor much better, and I think that’s something she can continue to do for us,” Louisville coach Walz said. Nebraska: Having already played two ranked teams, the Cornhuskers didn’t come into the Yum Center the least bit intimidated. They shot 56 percent in the first quarter and even led midway through the period. However, it wasn’t enough to overcome their season-high 23 turnovers. 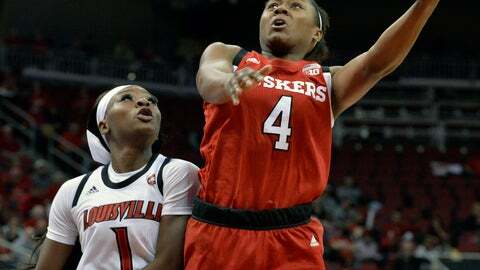 “Their defense is very relentless, and so it kind of just wears you down,” Nebraska coach Amy Williams said. While Walz acknowledges there’s room for improvement, he also said there are worse problems to have early in the season. “I’d rather be sitting here trying to get better defensively than trying to figure out how to score,” he said. Before the game, Louisville unveiled its banner for reaching last season’s Final Four, and in doing so, the school showcased the new, more conspicuous spot for the program’s achievements. The banner, along with ones for the 2009 and 2013 NCAA finalist teams, now stand next to the men’s Final Four and championship banners at the north end of the Yum Center.